Remove remaining raw meat from the grinder. This makes it easy to clean. This should be done before disassembling the grinder. Run a piece of bread through the feeding tube. The bread acts as a sponge soaking all the little pieces left in the grinder. It is not a must that you do this. But it makes the cleaning process easy for you. Having a lot of meat residue in the grinder can result to germs and bacteria formation. The first step should be disassembling the meat grinder. Remove all the detachable attachments. This should be done when the grinder is unplugged from the wall socket. Remove the feeding tube, grinding screw, grinding plates and cutting blade. Be careful when handling the blades. They are usually sharp and can injure you. The best way to clean the meat grinder is cleaning it by hand. Many people tend to use the dishwasher. This makes it easy to clean the grinder. But, it can ruin the metal as most grinders have metallic parts. It also dulls your blades if used several times. This reduces the grinder’s efficiency. If possible, clean the grinder using warm soapy water. Let all the detached pieces soak for 15 minutes. When left to soak, the meat residue left on the pieces will loosen. This makes it easy to clean. Scrub the pieces inside and out using a sponge or soft brush. A bottle brush should be used to clean your grinding plates, feed tube and the hopper. Never submerge the motor in water. Electric grinders come with a motor. You should never submerge them or pour water on them. Instead, use a sponge or a rag to clean your motor housing. We need to emphasis that the blades are extremely sharp. Handle them with care. After cleaning and rinsing the detachable parts, dry them. This can be done using a towel. Leaving them in the sun can also work. But do not leave them for many hours in the sun. Drying the parts helps in the prevention of rust and oxidation. Your blades do not need to be sharpened every time you use the grinder. It takes time before the blades are dull. The rubbing and grinding of meat sharpens the blades. You may only need to sharpen them after using them for a long time. It is advisable that you take the blades to a professional. They can either sharpen them or give you a replacement. In most cases, the blades become dull during storage. This happens if the blades are rubbing against other parts. This can be avoided by wrapping the blades in a cloth. This will prolong their lifespan as you do not need to keep sharpening them. The cloth also prevents the blades from getting nicked. The grinder needs to be stored in a place free of moist and dust. This is to prevent rust and oxidation. If possible, use oil to keep the parts free from oxidation. Coat them with a food-grade mineral oil coat. Using a spray bottle will help you coat the parts evenly. More attention should be given to the metal parts including the pusher and screw. After coating them, store them in a clean plastic bag. To keep the bag moisture free, throw a handful of rice. The rice will absorb moisture thus preventing rusting. This keeps the parts safe for many days and even months. When the time to use the grinder comes, use a disinfectant to clean the parts. This ensures that there are no bacteria on the parts. Additionally, use a bleach to remove all the foreign organisms on the parts. The bleach should be approved to clean cooking utensils. 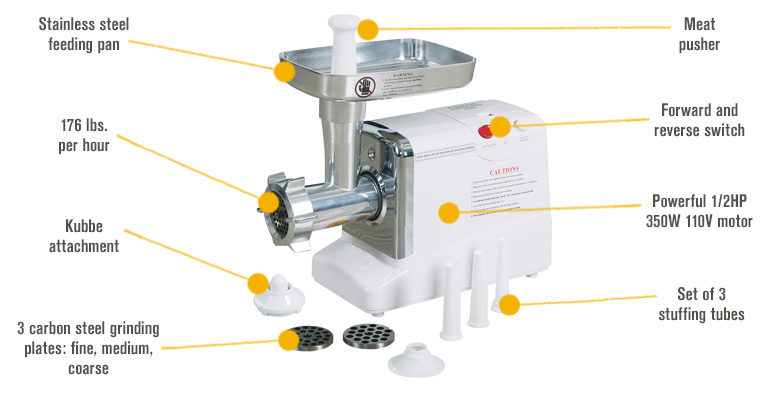 Having a meat grinder is a sure and easy way of making sure that you know exactly what your family is eating. You will be able to avoid additives, chemicals and bacteria found in store-bought meat. Maintaining the grinder in the best state is not a daunting task. It only takes you a few minutes. The guide above will ensure that the few minutes are well spent. Use the tips in this guide to help you maintain the grinder in a good state. They will also ensure that you are eating healthy foods. In case you are so busy, don’t have time to clean your meat grinder as well as your kitchen or your home, the best way is asking a help from a cleaning service. I have a meat grinder. But I wear it to clean up the troubled. Thank you for nice post. Its really helpful for me.